What to wear at a belly dance class is always a question I get asked and always information I give to new members of my classes. Most instructors and teachers will have their own rules on what their students and members should wear however most beginners classes usually require you to wear the same or similar dance exersise clothing. Here's what I advise my students and class members to wear at class. Remember - Clothing should be comfortable, Not restrictive. It should be airy and not too tight. 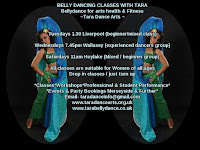 Always remember a Belly Dance Class is an exersise class you should make sure clothing fits well, isn't too tight, too long or restrictive in anyway. Think of what is advisable to wear at the gym. There are all kinds of glam styles of dance and exersise wear on the market.